Have you found yourself asking what’s the big difference between vinyl siding, polymer siding and steel siding? Since Polymer is the newest siding on the market I thought we should take a moment to investigate a litter further. According to Wikipedia: “Vinyl Polymers are a group of polymers derived from vinyl monomers. Their backbone is an extended alkan chain, made by polymerizing an alkene group (C=C) into a chain(..-C-C-C-C-..). Basically what this is saying is vinyl is polyvinyl choloride or as us un-chemists call it, PVC”. So basically, what I can interpret is that, THEY ARE THE SAME! To break it down, polymer is equal to vinyl which is equal to plastic. Below I outline what over 40 years in the industry tells us about plastic, vinyl or polymer. Polymer/Vinyl: The lifetime of vinyl is really pretty limited. They may say a lifetime… but after about 10 years that warranty is usually prorated. Vinyl, as we determined, is plastic… it expands and contracts due to heat and cold. When plastic does this it becomes brittle. Fade is another factor of vinyl. Set a toy outside in the heat and drape a towel over part of it for the summer… when you check it in a few months, you will see how much that toy has faded. Vinyl siding is no different. For example, a hail storm that comes in, it puts holes in your vinyl siding. Now you want to replace it with your homeowner’s insurance… they usually want to patch it. This means you have dark (new) and faded out (old) pieces on your house. Vinyl also has a tendency to mold on the North side and gets wavy over time. However, vinyl is more affordable, depending on who is bidding on it. We have seen some company’s estimates come in higher than our steel siding estimates. Below is a picture of hail damaged vinyl. Now for Steel: It doesn’t warp, crack, fade or dent. Yes, I said dent. 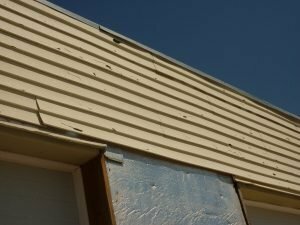 After 40 years plus in the business we have had only 5 – 10 calls on hail damaged steel siding. And that was some huge soccer ball hail! It does tend to be a little more expensive… but really you never have to do anything else unless you choose to on the outside of your home again. It has the same gauge of steel as your car, which shows it is pretty tough. Kent Mohler Exteriors will be happy to do either one, but we want you to be informed on what you are purchasing as well.